Red Faction started off as an FPS that made you destroy the environment around you. The games first appearance was back on the PS2 and was very well received. Unfortunately the THQ CEO Brian Farrell gave the shocking news that the series was now cancelled. If you're thinking this is like all the other Red Faction games in the series, think again. This game is a demolition derby. Single player mode provides players with training missions. In total you have 16 levels to complete which shouldn't take you too long. The real challenge is in attempting to reach gold medals. If you're not too good at the training, don't stress and just finish it with bronze to move on to the next level. Each stage varies in the challenges they provide, from survival to shooting ranges. The game picks the vehicle for you for each one that you do. The first level tests your racing skills in a speed trial. The controls take a while to adapt to, but once you have, it will be no problem. 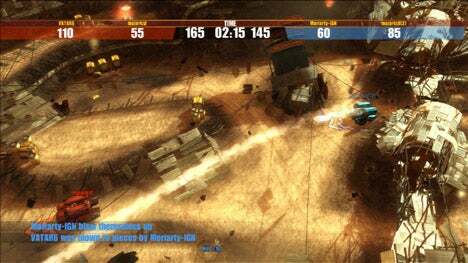 In multiplayer mode, you can choose to play either on Xbox Live or Local Multiplayer. Depending on what rank you are also effects what vehicles you have. If you're rank 1 you have the Miner ATV (racing car), EDF Scout (Tank) and the Light Walker. The game has a nice selection of modes, these are Deathmatch, Team Deathmatch, King of the hill, Capture the flag and Flag frenzy. The game looks decent at best. Don't expect to see your character very much since the game plays like Micro Machines with the top down view. Instead, feast your eyes on the landscape of Mars! At least two stages show the red and orange colours that are linked to Mars, as you race around the tracks. The other stages include an abandoned science lab which has been overrun by the plantlife, fortresses, factories and an ice mine. The sound effects for the game are one of the very few good points about the game. The music is perfect for the game with its hard hitting tracks. When you hit a barrel, the explosion is impressive to watch and hear. The most annoying noise to some would be the sound of you failing to reach the goal. It's like a sound of a machine shutting down. Lazy as the programmers are, the sound team couldn't be bothered to find a new noise or sound for when you die. Thankfully for this game there isn't a setting of easy, normal or hard. If you're looking for a challenge then this game will bring it to you This is due to the training missions being quite difficult, especially the later ones. To pass a mission all you need to do is reach Bronze. This is easier said than done for most missions. However keep playing the multiplayer and your vehicles will have upgrades. Which should make life a little less stressful, however the difference these make is barely felt. Getting the gold on all the training would be the hardest one to get. Some of the missions can really be annoying. If you're able to pull it off, it will score you a nifty forty gamerscore points. The survival ones really push players to show their full skill, but this ends up turning out to be more luck based than anything. This can lead to alot of anger, especially when you miss the bronze time by a few seconds. As for ranking up to level 20, it's really easy. Just keep playing the single player and multiplayer and it will soon add up. I have to say, they should've of gave you an achievement for even buying this game or even playing it. The game has two add-ons if you're still hungry for more. There are way too many problems with this game. After playing the game three times my rank and training had all been reset back to one. Playing a few multiplayer games, I noticed that one of the players was stuck on the side of the screen. When I asked if they were moving, they reported the same problem on theirs but with me. This left us with only one target instead of two, while the third player was able to kill us both, but also receive double kills per single kill. This game is nothing more than a cash-in for the Origins movie. If you like it however, knock yourself out with the two downloadable packs. you wrote If you're are thinking, it should be if you're thinking, or if you are thinking. Taken out thanks for telling me! interactivity with Red Faction Armageddon ? any value for the price (400 msp last week, free for armageddon preorders) ? so the low score is just for the technical promblems ? I played this with Pepz, to help out with the multiplayer aspect. I can safely say it's a weak game, not even worth 400MSP. It resets players progress randomly, not just the rank, but also the training and their medals. We did have a match with three of us, and only one was able to see all of us moving. The other two were stuck with one moving target, and one that you could destroy, but it didn't count. If I had known all the issues before I brought it, I wouldn't have got it even if it was free.